Born in Austria. Lives and works in Scotland. Studio holder at Edinburgh Sculpture Workshop. Sculpture events in cooperation with Lynn Cowan. Exhibitions and Artist Tours specifically designed for access by touch and presented for people with all sight abilities. 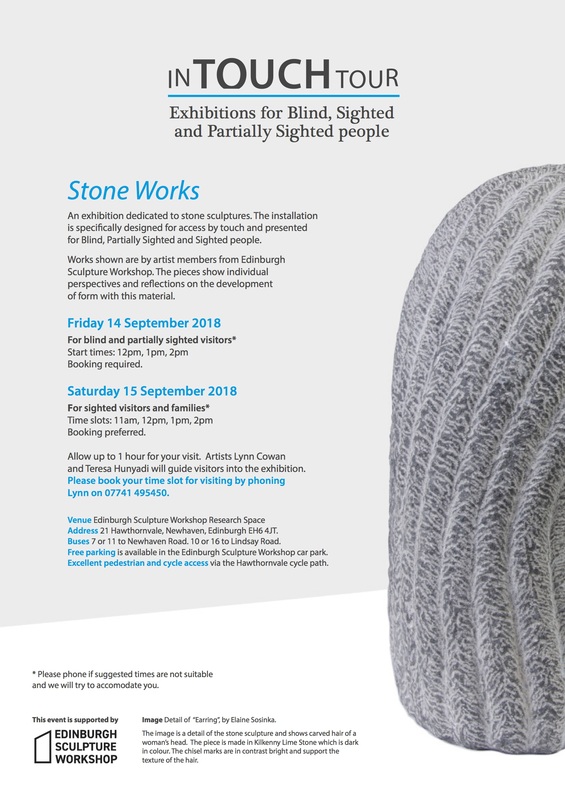 A project in support of the stone carving community in Edinburgh. 2015 to 2017 – Research on tradition and form of Masks. Leading to an independent body of work shown in the solo show On Masks in 2017. 2015 – Masters Degree (Mag.art), University of Applied Arts Vienna, Austria. Including work at Department of Education for Art and Design and department of Fine Arts. Masters Paper on Still Lifes with reference to Rachel Ruysch’s work to explore and connect several themes around the production, meaning and development of depicted flowers. 2015 – Exchange semester at the department of Sculpture, Joshibi University of Arts and Design, Sagamihara, Japan. 2009 – Diploma in Graphic Design, from Die Graphische Leyserstraße, Vienna, Austria. Diploma Project: Developing Material for the children’s education program of Museum Belvedere in Vienna. 2005 – Diploma in Kindergarten Pedagogy and After-school Care, Wr. Neustadt, Austria. Diploma Project: Art Education in Kindergarten and after school care with a focus on contemporary art practises as well as exploring influential Art in Central Europe at the beginning of the 20th century. © 2019 Teresa Hunyadi. All rights reserved.